The K11 Art Foundation (KAF) is proud to present the exhibition Neïl Beloufa: Soft(a)ware, the French-Algerian artist’s first institutional solo exhibition in China, guest curated by Victor Wang, alongside Guan Xiao: Elastic Sleep, an exhibition of Chinese artist Guan Xiao, presented in association with the Institute of Contemporary Arts (ICA), London, curated by Katharine Stout (ICA). These exhibitions reflect the active role the K11 Art Foundation takes in nurturing the outstanding creativity of artists and curators. Running concurrently, these two distinct and unique exhibitions by Neïl Beloufa and Guan Xiao highlight the artists’ common interest in the agency of digital communication and the Internet as a universal tool for understanding the world, regardless of geographical location. Both exhibitions foreground the visitor’s sensory experience by using sculpture and moving-image media to create immersive installations, which emphasise the imaginative possibilities for the relationship between the digital realm and the real world. Neïl Beloufa’s interweaving of technology, sculpture, video, and politics takes on new implications when presented within the context of China, where capital, the Internet, and online communication are regulated. Beloufa’s installations often combine moving image embedded within multi-sensory installations. Like an editor cutting together snippets of film, Beloufa’s immersive environments echo elements of his videos, moving between the film and the physical world. Spanning half of the chi K11 art space, the exhibition is divided into different stages, each showcasing existing and newly commissioned artworks never presented in China before. These different exhibition stages explore how sovereignty and the digital interrelate in the context of neoliberal transitioning. Being Soft(a)ware expresses a new-found subjectivity in our geo-digital realities, where an implied sense of agency in the selection and assemblage of information from physical and digital media is used to create an understanding of our world. 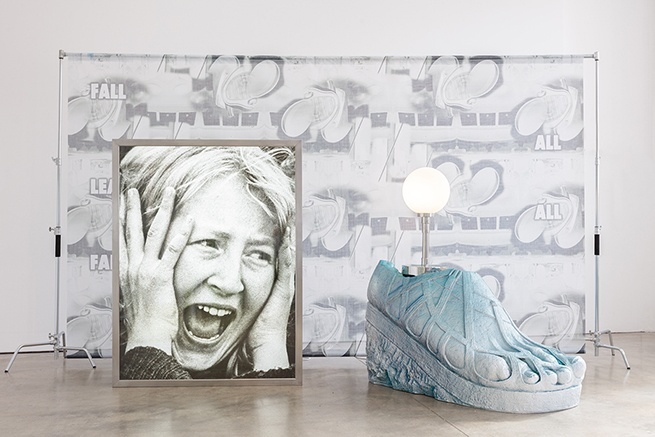 Running simultaneously, an exhibition of work by Chinese artist Guan Xiao, previously presented at the ICA, London, explores how present ways of seeing are influenced by digital image and information circulation, which have become an increasingly dominant source of knowledge exchange. Without seeking to fix definitions, her sculptural and moving image works juxtapose references from the past and present (or near future), weaving together both appropriated and originated visual and audio material, digital rendering techniques and objects to create evocative installations that integrate so-called primitive and modern elements. For this exhibition, Guan Xiao presents a series of large interrelated works in which mesh fabric printed screens form a backdrop for sculptural assemblages made of objects appropriated from sources ranging from ancient museum artefacts to high tech sports gear. Guan Xiao suggests both formal and conceptual equivalences, for example between the second and third dimensions, and the interdependent connections and flow between different ways of understanding the world and our place within it. This series of works highlights how our understanding of one thing is always in relation to another – sometimes rationally, sometimes not. Courtesy of the artists and chi K11 Art Space, for further information please visit www.k11.com. Platform China presents "ARROW PARADOX – Fu Jingyan Solo Exhibition"